When will free-traders-gone-wild own up to their complicity in brutal injustices like last week’s deadly factory fire? 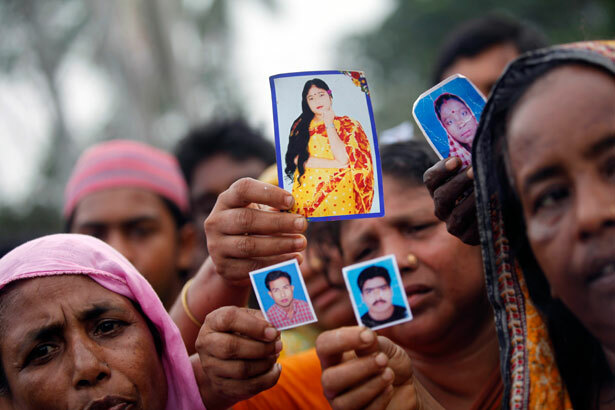 They are still digging up victims from the collapsed garment factory in Bangladesh—381 corpses and counting—while international media report the sickening details of crushed skulls and severed limbs and describe with sympathy the wildly distraught mourners searching the rubble for dead daughters. The Daka authorities arrested the greedy factory owner to save him from the mob. Sohel Rama, owner of the collapsed factory, blamed the pressures of global competition. He had no choice, he explained. Keep the sewing machines humming or else lose the contract. If a country can’t keep wages and costs down, its production will be moved to the next poor nation willing to sacrifice its citizens in the name of economic advancement. This is what organized labor calls the “race to the bottom,” and unions have campaigned futilely for decades to stop it. Only there is no bottom, really, in the global food chain because the world has a vast backlog of very poor nations desperate for jobs and anxious to please the multinational companies that buy the cheap goods and rebrand them as J.C. Penney or Benetton or best-buy stuff at Walmart. This is a very old story by now—these recurring tragedies of massive death for commerce. Bangladesh is getting good coverage because its carnage is likely setting new records. The grisly details will continue elsewhere for sure. Stories of thirty or fifty or 150 dead in industrial fires and other calamities are so routine, they begin to sound familiar and tiresome. We will see many more so long as fledgling enterprises in Asia and elsewhere are unwilling (or unable) to spend the modest sums required for routine safety measures. For shame, Bangladesh. How can you people be so indifferent to human life? In America, we think life is precious. Don’t we? At least, we think American life is precious. Those strange foreigners should learn to look out for their own the way we supposedly do. Enough of our sickening hypocrisy. Let’s drop the tear-jerk stories in American newspapers. Let us admit the cold truth about ourselves. The guilt for these distant deaths belongs to us—the self-righteous American government and morally obtuse American citizens. Not only because our people buy the stuff these young girls make in dangerous places where many of them will perish. But because the US government in Washington has the power to stop this inhumanity. The president and Congress will not stop it, of course. That would require an admission of responsibility for what goes on in producing nations that feed our consumer culture. More importantly, it would violate our precious idea of freedom—wondrously expressed by the free market that insures prosperity and delivers the goods with good prices. The federal government could stop these industrial scandals rather quickly by legislating rules of trade that prohibit any imported goods that are produced in barbarous conditions. This is not rocket science, as policy-makers like to say, nor without ample precedent. The so-called “free trade” system is actually a dense weave of import-export regulations that authorize government to inspect and reject goods at the border—drugs and food, for instance—if they do not comply with our standards for health and safety. A US trade restriction would require US importing companies to certify that the goods were produced in safe, sound factories. Nothing fancy, but basic terms that any modern society would insist upon for its own people. If a factory is falsely certified, the goods would be blocked from entry and a stiff penalty would fall upon the Walmarts of American commerce, not the bucket-shop operators in very poor countries. This would reverse the incentives and begin to build a floor of decency under what the trading system allows. President Obama and US multinationals are preparing a new free-trade agreement with Asian nations, but you can be sure there is nothing in it to protect the defenseless workers in Bangladesh and other poor countries. Indeed, US trade agreements, starting with NAFTA, have concentrated on insuring the rights of capital, not labor. We do not know what Obama will propose because his negotiations are being conducted in private consultation with the multinational companies—no labor representatives have yet been allowed to see draft agreements. The usual cheerleaders for globalization will instantly denounce this idea as a dangerous intrusion—protectionism!—that threatens free-flowing commerce. “Two cheers for sweatshops,” as The New York Times’s Nicholas Kristof and Sheryl WuDunn once declared. Yes, they would acknowledge, trade does involve some unfortunate negative qualities, but as poor nations prosper they will learn, in time, to insist on higher standards. This is the path to modern life, so best not interfere. Actually, unregulated globalization—shorn of human sympathy and oblivious to persistent cruelties—is the road backwards. The creative tumult of our era, with its fantastic inventions and globalizing production, has reverted to ancient injustices—forms of exploitation that originated three centuries ago with the English industrial revolution. When new machines like textile looms displaced human labor, the seasoned workers were dismissed, their skills no longer valued. They were replaced in the factory by children and women—cheaper laborers without power or influence who toiled in “the dark satanic mills” first described by the English poet William Blake. In our time, industrial capitalism has profitably employed the same exploitative routine, but with an essential difference. Thanks to global supply chains, contemporary sweatshops with dismal wages and sordid working conditions are located on the other side of the world. The people are exploited in various ways, but their cruel conditions cannot easily be seen by the American consumers who benefit from afar. Thus, it is very difficult for exploited workers to organize meaningful protests and build the popular support needed for a reform movement. Even to attempt protests threatens workers with retaliation by the multinational companies. They can readily pack up and leave, move the factories to the next low-wage country where people and governments are desperate for jobs and income, however pitiful. This cycle of exploitation is destined to continue until the world runs out of poor countries to exploit. Or until citizens in rich countries like the United States get over the ignorant indifference and face up to their guilty complicity with evil practices done in their name. The interactive La Ruta dramatizes an experience that many immigrants know too well—and senators could learn from. Read Aura Bogado’s review.